Anyone else here a crazed baseball fan? Re: Anyone else here a crazed baseball fan? One lowlife scumbag L.A. team down, one to go. EAT A D*CK, DODGERS! GO CARDS! F*CK MIZZOU! AND GIVE KANSAS CITY BACK TO KANSAS, A$$HOLES! Errr... sorry 'bout that. Kinda got carried away there. My Rox finally fired our GM and the new guy seems halfway competent and we have changed out our farming system for the Isotopes and another new AA team, so next year should hopefully be a different season for us. The Royals are looking insane. They barely squeaked into the playoffs and haven't lost a game since. Reminds me of my 2007 Rox. Barely made it into the postseason, blow through everybody in the NL...only to get swept by the Red Sox in in WS. KC's outfield is insane, plus they have tons of speed and a manager willing to take risks. DOH! Walk-off homer to even up the series. 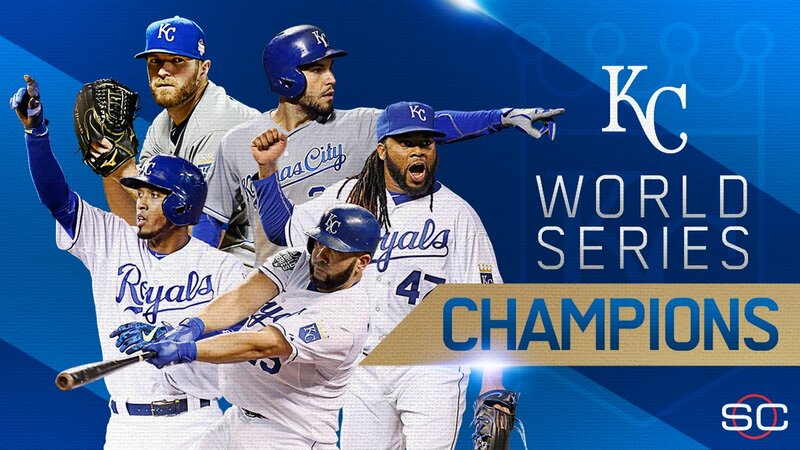 Kansas City still making a postseason name for themselves...for the first time in my lifetime. (KC was last in the playoffs in '85, I was born in '86). And San Francisco decides to one-up the Cardinals and take a walk-off for themselves. This is a very intense and eventful postseason. Holy crap, there's fireworks goin' off right now in my neighborhood in celebration! And now the Giants will show you who the real kings of major league baseball are! Introducing honorary Giants relief pitcher Joe Montana! Well, here we are...game 7. Bumgarner gets into his third game of the series and has been killing it again tonight. If they win, it will be because of his insane performance. What a pitcher to have. 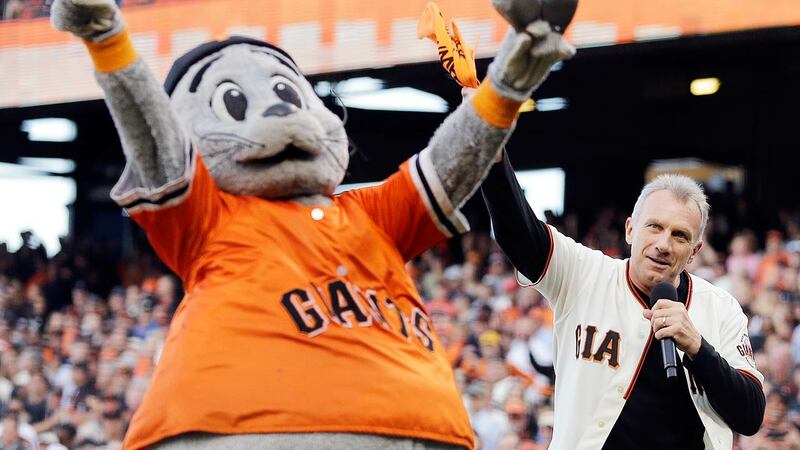 WOOOOO SAN FRANCISCO GIANTS THREEPEAT-IN-EVEN-YEARS WORLD SERIES CHAMPS, BABY!!! EAT IT, L.A. FANS! Oh yeah, you were all laughing and carrying on when the Codgers won the division. But you're not laughing NOW, are you? ARE YOU, I SAID!!! Go drool all over your beloved Fakers, losers! Yeah, I got your ring to kiss RIGHT HERE! OH!!! baseball world another bay-area world series! They couldn't let a bunch of upstart ham-&-eggers from some glorified flyspeck cowtown in the middle of nowhere win it all, right? HELL NO! Kansas City? Yeah, more like Kans-A$$ SH*TTY! ANYway, see me be just as big a d*ck in 2016 when the Giants win it all for a fourth time! It's gonna happen, you'll see! Now if you'll excuse me, I gotta tune into the local Fox affiliate KTVU to watch live coverage of rioters burning San Francisco to the ground. 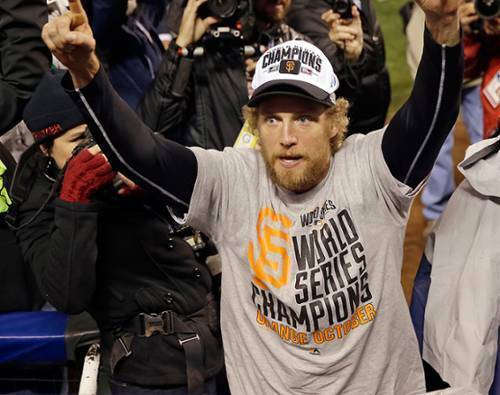 - Some homeless guy who swiped a World Series Champs cap and t-shirt? Fun team to watch, but was surprised the Mets didn't take a few more games. My brother pitched with and is good friends with the brother of Luke Hoechever, so I was pulling for the Royals. I'm a Red Sox fan, so no dog in the fight. Congrats Adam! We should just call them the Milwaukee Brewers. Not to be that guy, but that picture just screams "There are white people on the team - let's put shadows on them so they all look the same color!" . Congrats to KC though. They've been waiting for the team to become relevant and have been pretty supportive, so it's a nice pick up for a city that's had a terrible run of sports lately. Good game with the Chiefs this week too to cap it off.